" A refreshing blend of humor and action that lets you check out of your reality for a couple of hours and check into an exciting world where good triumphs evil and it does so in marvelously inventive ways. " When an unexpected enemy (Loki) emerges that threatens global safety and security, Nick Fury (Samuel L. Jackson), Director of the international peacekeeping agency known as S.H.I.E.L.D., finds himself in need of a team to pull the world back from the brink of disaster. Spanning the globe, a daring recruitment effort begins. Enter the all-star cast of Marvel Super Heroes - Iron Man (Robert Downey Jr.), The Incredible Hulk (Mark Ruffalo), Thor (Chris Hemsworth), Captain America (Chris Evans), Hawkeye (Jeremy Renner), and Black Widow (Scarlett Johansson). Awesomeness ensues. “So awesome.” Those were the first two words that came to mind as I scoured my brain in an effort to find a fitting description of what I had just witnessed. Why be loquacious, when two such honestly efficient words will do? Come on, what else do you want me to say? The Avengers hits the ground in overdrive, downs a six-pack of energy drinks, and rarely takes a breath during the course of its purely entertaining 142 minute runtime. Burdened with a glorious purpose, Loki (Tom Hiddleston) makes his presence known quickly. He comes to earth to rule and leaves Nick Fury (Samuel L. “Snakes on a Plane” Jackson) and his awesome eyepatch with no choice but to revisit the failed Avengers Initiative. The film recognizes that there are a lot of male egos that need clashing and thus wastes no time in delivering exactly what the audience wants to see – 2+ hours of superhero bliss. As intense and exhilarating as the climactic 40+ minute battle against Loki and his minions is, the hero vs. hero, alpha male vs. alpha male build up is even better. Captain America vs. Thor. Iron Man vs. Thor. Thor vs. Hulk. Hawkeye vs. Black Widow. Come on now. I think I even saw a kitchen sink in there battling it out. Director Joss Whedon clearly thought through the scenarios that fans would want and he flawlessly delivers them with style. A little panache, if you will. Executing the individual battles in a way that does justice to the characters is not an easy task, but the special effects and 7.1 Surround Sound are crafted to perfection. If you’ve seen the individual Avenger movies then you know exactly what to expect from the characters. Tony Stark cracks wise with his sarcastic humor, Thor cracks heads with his magic hammer, Captain America cracks nary a smile with his old-school, no-nonsense patriotism, and Hulk, well, he just smashes. Add Black Widow, the former Russian assassin, and Hawkeye, a master with the bow and arrow, to the mix and that is a whole lot of superheroes demanding a limited amount of screentime. The good news is Whedon handles this potential problem seamlessly, giving everybody ample time to do their thing and play their part. The biggest surprise, both literally and figuratively, has to be The Hulk. Not only is this the most “realistic” version of the beloved green rage monster that’s been delivered to the big screen, but he simply steals every scene he’s in. The Avengers is the kind of roller coaster thrill ride of a movie that takes me back to the magic I felt as a kid every time I walked into the theater and sat down to watch a much-anticipated Summer blockbuster. It’s a refreshing blend of humor and action that lets you check out of your reality for a couple of hours and check into an exciting world where good triumphs evil and it does so in marvelously inventive ways. If you can’t enjoy The Avengers then I fear you simply can’t enjoy life. Shoot me an email and we’ll see if we can’t introduce some joy into your world. Ed Norton was set to reprise his role as Bruce Banner, but negotiations between him and Marvel Studios didn’t exactly go well. Lou Ferrigno is the voice of the Hulk in the film. Watch for Tony Stark’s Black Sabbath t-shirt. Robert Downey Jr. is in Friends & Lovers with Stephen Baldwin who is in The Young Riders with Josh Brolin who is in Hollow Man with Kevin Bacon. 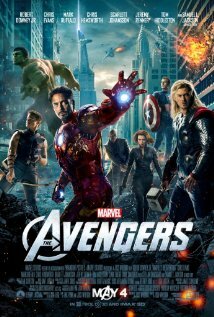 Rated PG-13 for intense sequences of sci-fi violence and action throughout, and a mild drug reference, The Avengers is pretty clean. There is some random off-color language (1 or 2 instances each of a**, son of a b***h, d**n, pi**ed off), but the main reason for the PG-13 rating is the wall-to-wall sci-fi violence. A few deaths occur on screen but there's no blood or gore. Sexuality is limited to women in tight superhero outfits. Very well written. Can’t wait to see it. Btw, who plays Nick Fury in this one? This review was spot on. It was one of the best (if not the best) Action movies I had ever seen. Any word if my hero (Joss Whedon) will be at the helm for the next one? My guess is he’s waiting for the studio to approach him with a price that’s right.